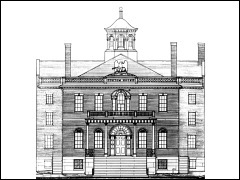 Until 1818, the Customs Service rented a variety of buildings in Salem for use as a custom house. Custom revenues provided a substantial portion of government income throughout the later part of the eighteenth century and the beginning of the nineteenth. The Salem customs agents, responsible for a bustling port, collected large tariffs on imports and were also charged with storing bonded goods. In 1818, the Treasury Department allocated funds for the purchase of a lot and construction of a new customs building along Derby Wharf. Treasury agent William F. Lee, then Collector of the U.S. Customs at Salem, was designated to oversee the project and selected Perly Putnam, a Weigher and Gauger, and Jonathan P. Saunders, the Surveyor of the Port, to draw plans for the new building and oversee construction. Salem Maritime National Historic Site for scanning portions of the H.S.R.